BobcatFans.com - View topic - What's Wrong With This Picture? The Vegas handicappers put up the line for the App State game this morning. They usually have a pretty good idea about the pulse of both teams, so I give them credence on their opening lines. Bobcats are 21.5 pt dogs with a an O/U of 48 pts. This would imply a score of 35 - 13. Now, I'm ecstatic that the Cats have won a third game this season, and could see them actually beating App State. But my concerns are many. If WJIII can hang on to the ball and not fumble for a scoop-six, we'll have a much better chance. He's been a lot better in the last two games, so Withers must be pounding that idea in WJIII's head. We were up over GA ST 33-10 heading into the fourth quarter, but the Cats took their foot off of the Panthers' neck. They came back an scored 21 points in the fourth. Can our defense keep the Cats in them game, much less keep App State from scoring? Can the O-line hold off the App State D-Line? And our Defense is without it's best player this week, so they will have to step it up against App St. Still no answer for our kicking game, other than answering "go for two"
London is only out the first half of the game, I believe. 1. 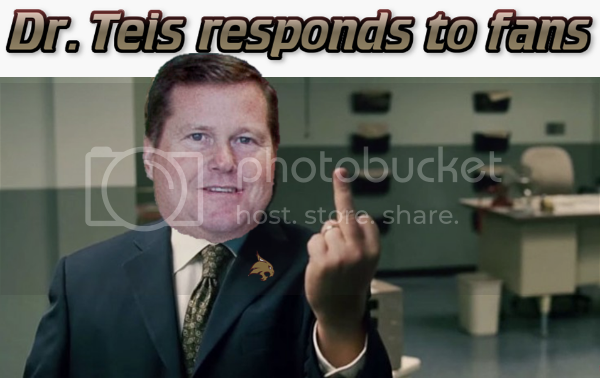 Larry's lack of engagement in building a fan culture at txst. 2. Lack of winning. When we win, attendance goes up but it still wasn't where it should be. Thats why this is number 2 and not number 1. 3. We do have to do some self-reflection as fans and take some ownership of the stands being empty. Not every team with a worthless AD and poor results have as many open seats as us. Can't argue with any of those 3 points. There is NO VISION coming from the marketing department.